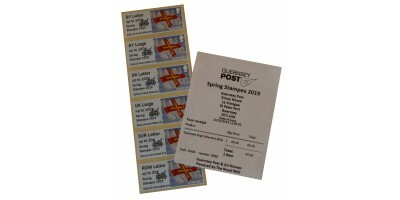 Guernsey Post is delighted to offer the B series of Guernsey Post and Go Spring Stampex February 2015 featuring the Guernsey Flag. 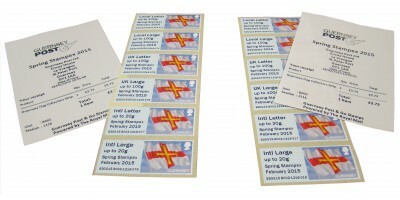 The Guernsey Post and Go stamps are available in six tariff wei..
Guernsey Post is delighted to offer the B series of Guernsey Post and Go Stampex Valentine Exhibition Sheet Overprint featuring the Guernsey Flag. 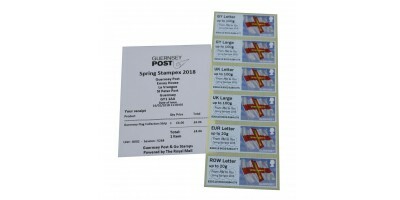 The Guernsey Post and Go stamps are available in six ..
We are able to offer a Set of 6 Stamps 'G' series Guernsey Flag stamps with our Envoy House overprint.Gsy letter up to 100g UK letter up to 100g Gsy large letter up to 100g EUR letter u..
Issue date: 20th April 2018We are delighted to offer the Guernsey Post and Go issue B Series 89th Scottish Congress 2018 overprint featuring the Guernsey Flag. 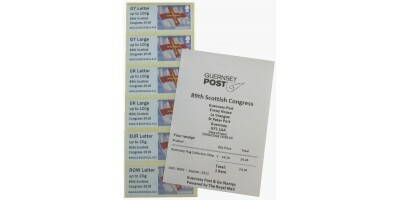 The Congress is being held in Perth on t..
SOLD OUTGuernsey Post is delighted to offer the G series (GG01) temporary location Smith Street overprint featuring the Guernsey Flag are now available. 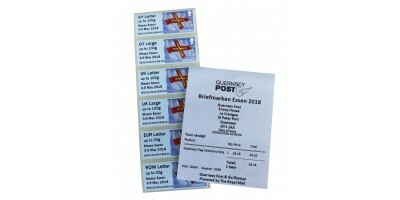 These stamps are now no longer available from S..
Guernsey Post is delighted to offer the back office series of Guernsey Post and Go Essen Stamp Fair May 2018 overprint featuring the Guernsey Flag. 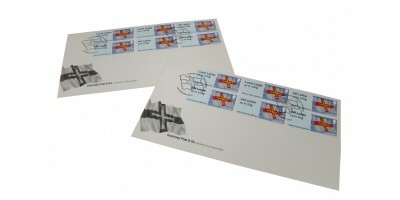 This back office strip will carry the a new back off..
We are delighted to offer the Guernsey Post and Go issue back office series (GG04) 100 years Royal Air Force overprint featuring the Guernsey Flag.The Guernsey Post and Go stamps are available in six ..
Guernsey Post is delighted to offer the B series of Guernsey Post and Go Stampex Flowers Overprint featuring the Guernsey Flag. 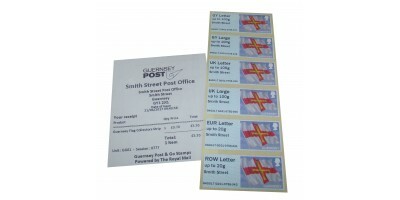 The Guernsey Post and Go stamps are available in six tariff weight steps..
Guernsey Post is delighted to offer the first in our series of Guernsey Post and Go issues, released on 18th February 2015, featuring the Guernsey Flag. 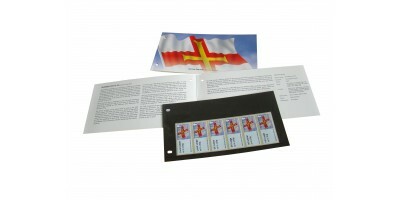 The Guernsey Post & Go ‘B Series’ stam..
Guernsey Post is delighted to offer the B series of Guernsey Post and Go Essen Stamp Fair May 2015 overprint featuring the Guernsey Flag. 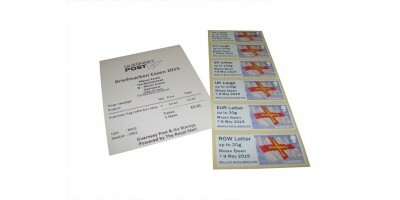 The Guernsey Post and Go stamps are available in six tari..
Guernsey Post is delighted to offer the B series of Guernsey Post and Go Europhilex May 2015 overprint featuring the Guernsey Flag. 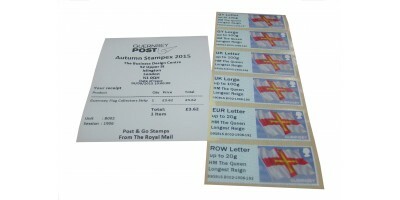 The Guernsey Post and Go stamps are available in six tariff wei..
Guernsey Post is delighted to offer the B series of Guernsey Post and Go Stampex Autumn 2015 overprint 'HM The Queen Longest Reign' featuring the Guernsey Flag. 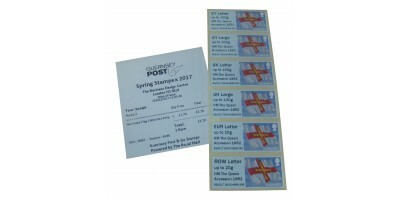 The Guernsey Post and Go stamps ar..
Spring Stampex 2016 overprint - 500 Years of Postal History, 'B' SeriesThe Guernsey Post and Go stamps are available in six tariff weight steps:GY Letter up to 100gGY Large Letter up to 100gUK Letter ..
Guernsey Post is delighted to offer the B series of Guernsey Post and Go World Stamp Show New York 2016 Overprint featuring the Guernsey Flag. 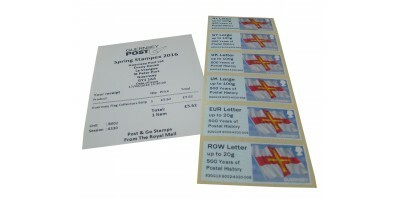 The Guernsey Post and Go stamps are available in six tari..
Guernsey Post is delighted to offer the B series of Guernsey Post and Go The Battle of the Somme 1916 -2016 Overprint featuring the Guernsey Flag. 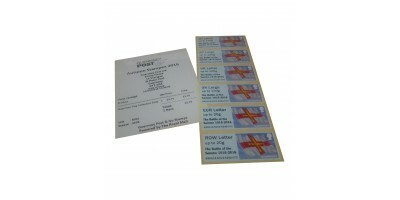 The Guernsey Post and Go stamps are available in six ..
Guernsey Post is delighted to offer the B series of Guernsey Post and Go HM The Queen Accession 1952 Overprint featuring the Guernsey Flag. 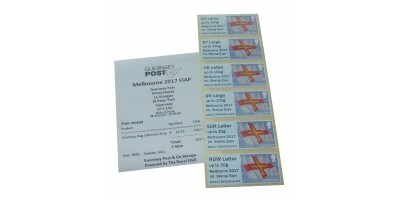 The Guernsey Post and Go stamps are available in six tariff ..
Guernsey Post is delighted to offer the B series of Guernsey Post and Go Melbourne overprint featuring the Guernsey Flag. 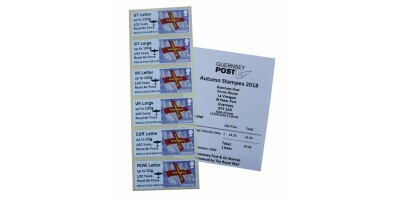 The Guernsey Post and Go stamps are available in six tariff weight steps:..
We are delighted to offer the Guernsey Post and Go issue B Series HRH Prince Philip 65 Years of Service overprint featuring the Guernsey Flag. 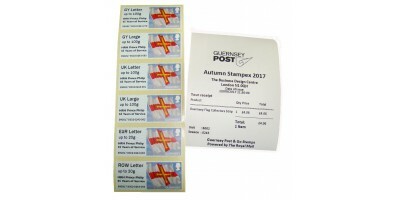 The Guernsey Post and Go stamps are available in six tari..
Guernsey Post and Go is a new generation of Self-adhesive stamps that will join the Post & Go family of products from Royal Mail. 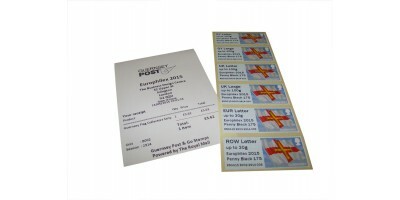 As with Royal Mail, Guernsey Post & Go stamps carry unique identification numbers depending on the machine and session number of where they were issued. 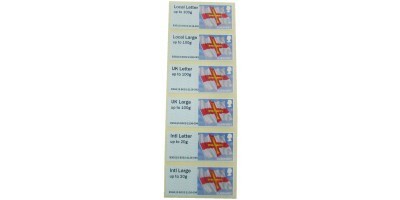 If you already collect Royal Mail Post & Go stamps, this is a perfect opportunity to add a new, exciting product to your collection. 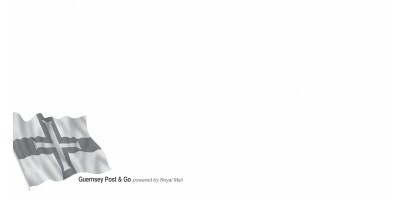 New in September 2015, Guernsey Post now hosts a Royal Mail Post & Go kiosk. 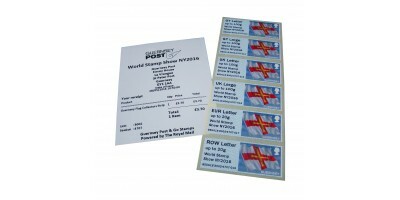 G series stamps available to purchase at our head office at Envoy House or here online.